Accurate information is critical to an informed choice. Recent communications from various sources about faculty unionization have contained inaccuracies, which we hope here to correct. The data show that the percentage of tenure-track faculty has declined since 2002 and the percent of lecturers has increased, but modestly. It is important to note that “WOT” faculty are without tenure by reason of funding. They perform all of the duties of tenure-track faculty, including teaching, and are considered tenure-eligible. The size of the WOT faculty largely varies with availability of grant funding; they are not viewed as replacements for duties that might otherwise be performed by tenure-track faculty. In the Non-Health Science Schools and Colleges on the Seattle campus where the use of WOT appointments is infrequent (under 2%), 68.4% of the faculty is tenure-track in 2015. At UW Tacoma and Bothell the % of tenure-track faculty is lower, comprising 48% of the faculty and lecturers 51%. This is largely due to the rapid growth of those campuses. However, the trend is for increases in tenure-track appointments, with over 70 new additions to the tenure-track ranks from 2012 to 2015, although the % increase was quite modest (2%). While tuition increased by double-digits during the Great Recession, even at its high point of $12,397, UW’s tuition and fees for resident undergraduate students were still in the bottom quartile of our peers.2 As we know, in 2015 the Legislature actually reduced tuition, the only state to do so. Charitable donations to the University are at an all-time high, an indication of the broad-based support in the community for our public mission and a recognition of the excellence of the UW and the faculty. Private donations do not replace public tax dollars or tuition. Rather, philanthropy provides an additional margin of excellence to enable the University to do even more with its resources than otherwise would be possible. These data appear to be from 2012.3 From FY 2013 to FY 2016, state funding to UW has increased by more than 39%, or $82.4 million. These funds have allowed the UW to fund annual faculty salary increases, and to freeze and reduce undergraduate tuition rates. In 1990, the state provided 82% of funding per UW undergraduate student, and families paid 18%. By 2013, state support had fallen to 28%, and students and families paid 72%. 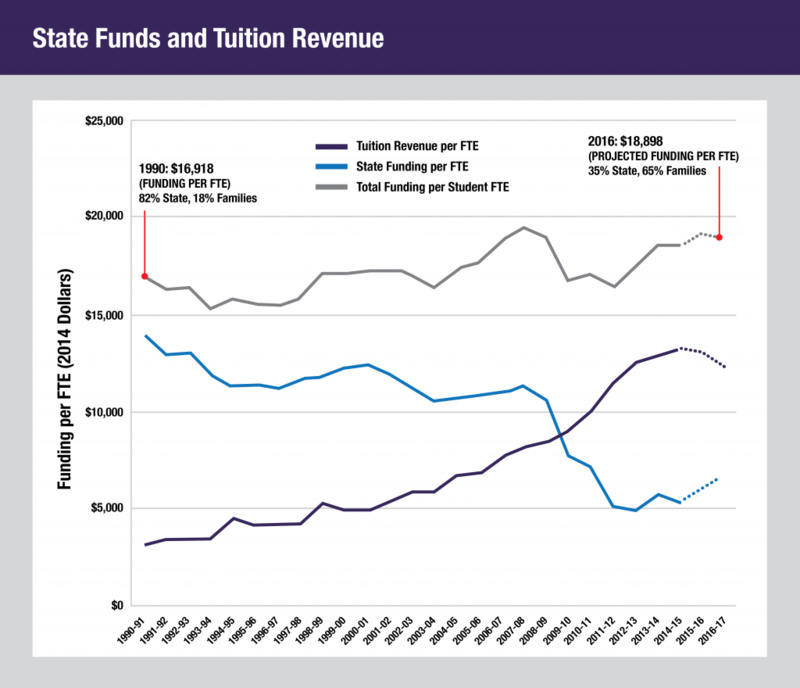 As state revenues improved, UW and the other public baccalaureate institutions asked the state to set a goal of returning to “50/50 by 2020.” Emerging from the Great Recession, the Legislature and Governor have begun to reverse the trend by making significant reinvestments in the UW and public higher education (on pace to reach a 35%/65% split by FY 2016) as can be seen in Figure 2. Federal funding for research has gone through its ups and downs in the past six years. But in FY2015, the research funding for universities and non-profits was actually up 12% since 2009, and funding for NIH was up 2% in the same time period. UW continues to be effective in advocating for increased research funds, while at the same time, our faculty are increasingly competitive for federal research funds. The percentage of all federal research funds that the UW receives has increased since 2009 from 2.9% to 3.4%. The FY2016 approved budget has a number of bright spots including a $2B increase for NIH funding (a 6.6% increase) as well as significant increases to the research budgets of NASA, DOE, DOD, and the FDA. While awards from non-federal sources have been growing as a share of UW’s overall research portfolio, these awards represent important research projects from non-profit organizations (e.g. $8M in FY15 from Seattle Children’s Research Institute), foundations (e.g. $65M in FY15 from the Bill and Melinda Gates Foundation), and industry sponsors (e.g. $50M in FY15 for clinical trial projects). The Office of the Provost and the Office of Research also support faculty research through internal granting programs such as the Bridge Award Program (~$1M/yr. ), Royalty Research Fund Program (~$2.5M/yr. ), Innovation Awards (~$1M/yr. ), and startup/matching funds (~$7.3M/yr. ).